To begin with, it is important to understand that since 1993 in the US, and 1994 in Canada, all residential door openers have come with two reversal systems for your increased safety. The first one is mechanical: if the bottom section of descending door hits an object, the motor detects the resistance and the door reverses. The second is photoelectric: it consists of two units installed about 4 inches from the floor, on each side of the door. 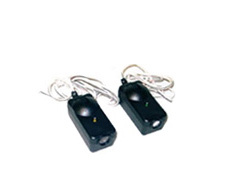 One unit emits an infrared beam, invisible to the naked eye. The other unit is a reflector. If something breaks the beam while the door is closing, the opener motor automatically reverses direction and opens the door. It could be the case that your current door opener doesn’t have a photoelectric reversal system based on when you bought it. You cannot add one to it because it wasn’t designed to have this option added. To ensure that your two reversal systems are working correctly, contact us. I pushed the button to close my door. It lowers only a few feet then opens. What exactly is going on? This is an obvious sign that beam of your photoelectric reversal system is out of alignment. Simply reposition one of the two units. If you have a wall control panel (and not a door bell), you will notice a flashing indicator light. By repositioning one of the two units, this light will stop flashing. 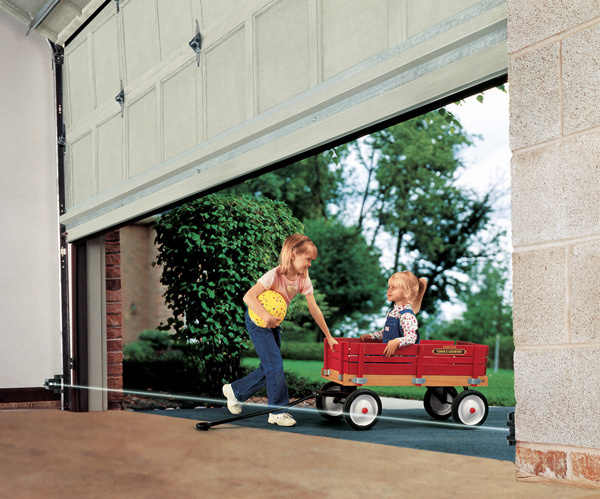 Also, it could happen that, based on the orientation of your garage door compared to the sun, this could affect the correct operation of the photoelectric system. For a short period of time, when the sun’s rays hit the receptor unit of the photoelectric system, the system will be affected so that it reacts like an object is passing in the beam. In this case, your door will not close. The solution: reverse the two units so that the receptor isn’t in the sun, or install a shield to stop the sun from interfering with the operation of the beam. 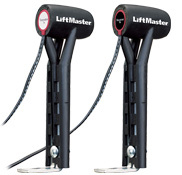 Read more about the maintenance to perform on your door opener. Are there photoelectric reversal systems for my commercial door openers? Yes, there are several available based on your type of day-to-day operations. In 2010, the UL‑325 standard was modified to reflect user safety. 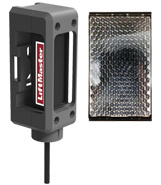 Since then, LiftMaster has added a photoelectric reversal system (CPS‑U) to its commercial door openers. I am the manager of a condominium building. What safety accessories do you suggest I install? 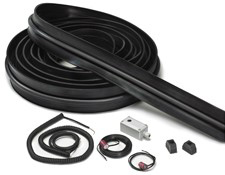 a pneumatic edge system (OES‑SD24): when the bottom section comes in contact with an object, the pneumatic system sends an electric signal to the motor that reverses the path of the door. a photoelectric system (CPS): There are four different models depending on the width of the door and the amount of protection you are looking for. What should I do if the wire leading to a unit of my residential door opener’s photoelectric system is severed? It all depends where the wire is cut. If it is at the entry to the unit, the fact that its plastic housing is sealed and cannot be opened means a new unit must be purchased and the wire from the unit reconnected to that leading to the motor. If it is severed a few inches from the unit, you just need to strip the wires, reconnect them and wrap it all with black electrical tape. Can I replace just one unit of my photoelectric reversal system? Unfortunately, no. Both units must be changed because door opener manufacturers only offer them in pairs. However, don’t delay in changing your photoelectric system. This is for your safety. Replacing the two units takes just a little time, maybe only 20 to 30 minutes.